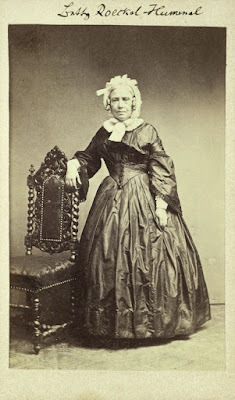 Mozart's first daughter Theresia Konstanzia was born on 27 December 1787 in the house Stadt 281, "Zum Mohren" ("At the Sign of the Moor", today Tuchlauben 27, today's building dating from 1884). 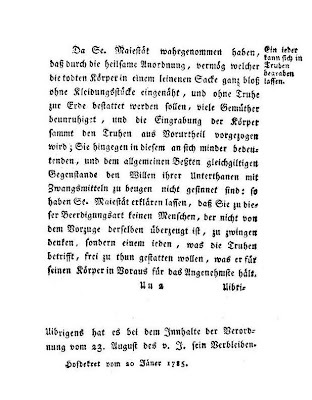 Apart from publishing this entry with a wrong number (198 instead of 195), with several mistakes and without the name of the officiating priest Joseph Petz (which is given on the far right), Blümml was also unaware of the fact that the document he copied was nothing but a later fair copy of the original 1787 entry. Only a few of the old original baptismal registers of St. Peter's survive. Mozart scholarship was unaware of their existence until on 24 August 2006 I realized their significance and published the original entry concerning Theresia Mozart's baptism for the first time in my article "Mozart's Apartment on the Alsergrund" on 8 June 2009. 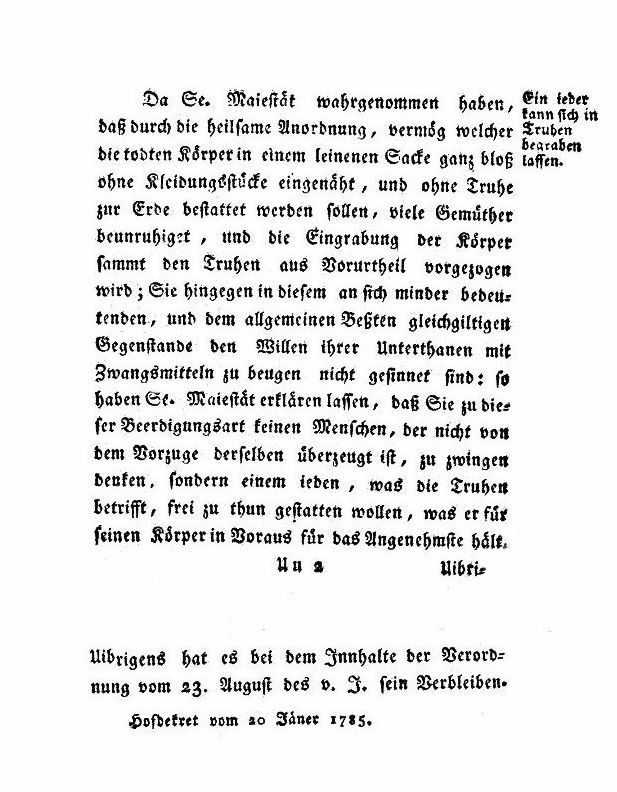 Contrary to Blümml's and Deutsch's assumption the original document shows that Theresia Mozart was not baptized at St. Peter's Church, but in the apartment of her parents in the Tuchlauben. The note in vol. 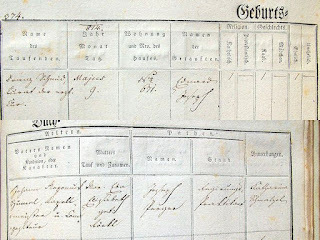 2 of the original baptismal registers of St. Peter's: "Im Hause getauft. wider die Verordnung. wegen angeblicher Schwachheit des Kinds. ", showing that Theresia Mozart was baptized at home. 172 years after the foundation of the Mozarteum which (among other objectives) was established "to collect Mozart documents", there are still many pivotal Mozart documents in Vienna's archives that hitherto have escaped the attention of researchers who are confined to a desk. In his article "Mozart: In und vor der Stadt" in the journal Wiener Geschichtsblätter (2/2012) the Viennese amateur historian Walther Brauneis plagiarized my discovery of Theresia Mozart's original baptismal entry by simply copying everything from my article and from the pictures of the entry that I had published online in 2009. Brauneis gave himself away by shortening the shelfmark "A-Wstm, St. Peter, Taufbuch (original copy), Tom. 2, fol. 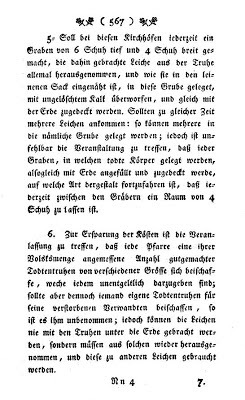 123" in footnote 8 of my article into the revealingly false "Taufbuch Pfarre St. Peter, Bd. 2, fol. 123". This incomplete (and therefore wrong) shelfmark refers to a completely different and much later "Band 2" of the baptismal records in question. In the course of his copying Brauneis did not understand what the words "original copy" in the footnote of my article meant. Because he had never actually seen the books in the parish archive, he did not know that there are two series of early baptismal records of St. Peter's: the original books (which had been ignored prior to my research and to which I referred with the words "original copy") and the later copies of these books with volume two beginning but in January 1804. From now on all crypts, cemeteries and graveyards which are located within the limits of villages shall be closed and instead only those should be used that are located outside the villages within reasonable distance. Following the last will of the deceased or the the wishes of the relatives all bodies should be carried to the churches by day or in the evening according to the regulation of burial fees and funeral cortege, be consecrated and laid to rest with the usual church prayers and then be brought by the parish priests to the chosen cemeteries outside the villages to be buried without ostentation. For these cemeteries a place of appropriate size is to be chosen which is not exposed to water and whose soil is not of a type that prevents decomposition. After the area has been selected it should be surrounded with a wall and adorned with a cross. Since the burial can serve no other pupose than to further the quickest possible decomposition, which is prevented by nothing more than the burial of bodies in coffins: thus it is commanded that the bodies should be sewn into a linen bag, completely naked and without clothes, then put into a coffin and be transported to the graveyard. In these cemeteries there should always be made a pit with a depth of six Schuh [one Austrian Schuh was 12,6 inches] and a width of four Schuh, the body should always be taken out of the coffin and put into the pit, as it is sewn in the bag, be covered with quicklime and immediately be covered with soil. In case several bodies arrive at the same time, they can be put into the same pit, but at anytime it is to be observed that every pit into which the bodies have been put be immediately filled and covered with soil, which must be continued in such a way that there is always a space of four Schuh between the graves. To cut expenses it has to be arranged that every parish acquires an appropriate number of well-made coffins of various sizes which must be provided to everybody for free; if somebody should provide his own coffin for his deceased relatives, he remains free to do this; but the bodies must never be put into the ground with coffins, but have to be taken out again to use the coffin for other bodies. 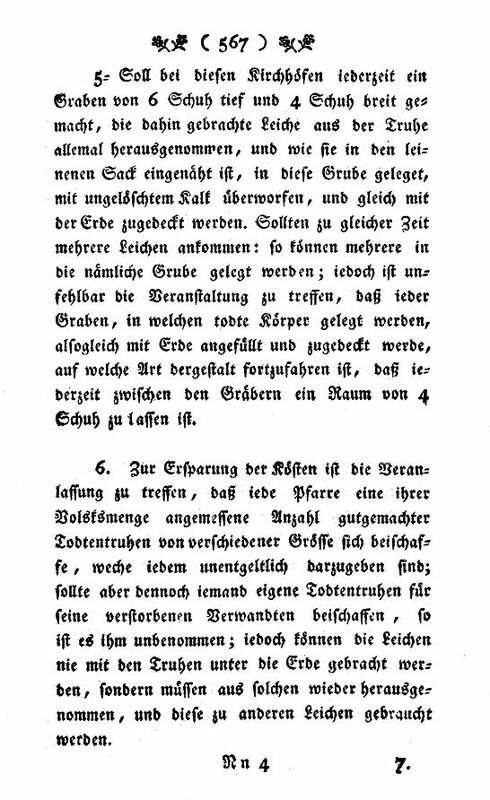 Paragraphs 5 and 6 of the 1784 Josephinische Begräbnisordnung in Kropatschek's collection of laws of Joseph II. 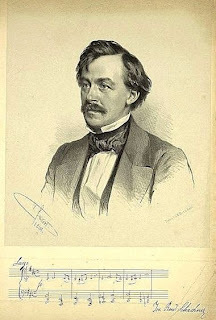 Die Edlen im Volke wünschen, Kaiser Joseph möge überhaupt mit minder schädlichen Fehlern und Schwachheiten der Menschen etwas mehr Nachsicht haben. Unter diese Schwachheiten gehört die Abneigung, sich in Säcke einnähen, und dann durcheinander in eine Kalkgrube hinschleudern zu lassen. The noble of the nation wish that Emperor Joseph would show a little more leniency towards the less harmful flaws and weaknesses of the people. Among those weaknesses is the reluctance against being sewn into a bag and then being tossed into the muddle of a lime pit. Everybody is allowed to be buried in coffins. The Emperor's withdrawal of obligatory burials without coffins in vol. 8 of Kropatschek's collection of laws. 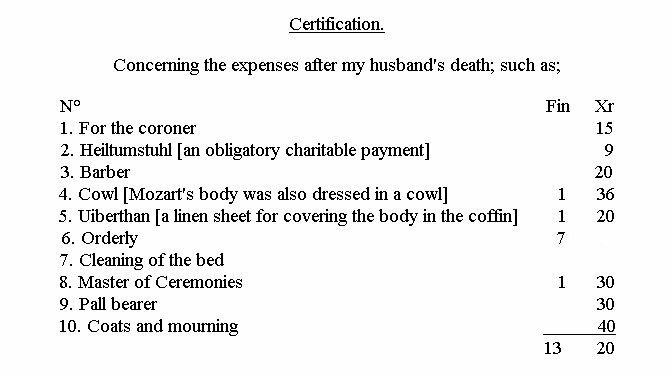 The documents concerning the expenses for Mozart's coffin are lost. But there are of course archival sources from Mozart's time that show as to how the procurement of a coffin for a common citizen was handled and how much it cost. When Mozart moved into the house Alsergrund No. 135 in June 1788, he made the acquaintance of Christoph Dopler who lived there in a small apartment on the first floor, together with his wife Magdalena (née Neu) and his youngest two children Maria Anna and Karl. 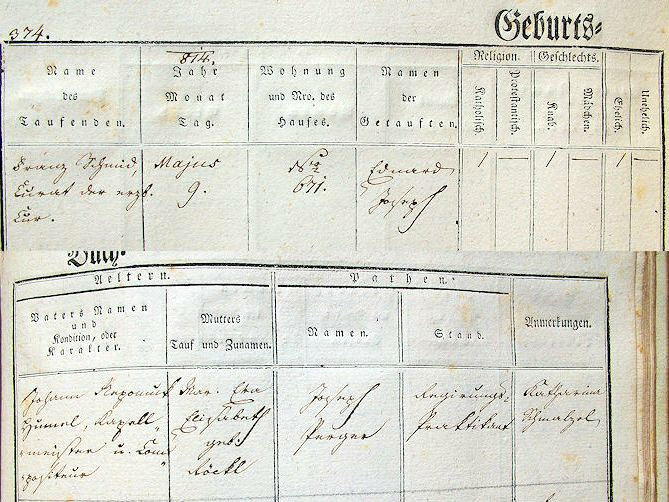 Christoph Dopler in the 1788 tax register of the house Alsergrund 135. His neighbor, the shoemaker Peter Dußel, signed as witness in Dopler's probate documents (A-Wsa, Steueramt B34/27, fol. 218). Dopler was born around 1739 in Loosdorf in Lower Austria. At the time of his wedding in 1764 (St. Ulrich 25, fol. 188v) he is described as "soon-to-be innkeeper". In 1769 he is referred to as "former innkeeper in the cemetery of the Benedictine friars of Montserrat" on the Alsergrund, (which was closed in 1783 and was located about here). In 1771, in the baptismal entry of his daughter Regina, he is documented as being employed as Goldpolier (gold polisher) at the porcelain factory and in 1773 he is already given as "Mahler in der Porcellain Fabrique" (painter at the porcelain factory in the suburb of Rossau). Dopler's speciality was painting so-called Türkenbecher (turkish cups). It is to be noted that Dopler was not a wealthy individual. His modest estate was estimated at about 34 Gulden. The cost of Dopler's coffin equalled the estimated value of his wall clock. The coffin cost six Kreuzer less than the cowl in which Dopler's corpse was dressed. 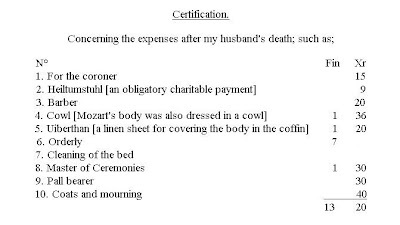 The following list of Magdalena Dopler's private burial-related expenses provides a fascinating look at the burial customs in late 18th-century Vienna. In December 1791 Constanze Mozart – except for the orderly's wage – was certainly faced with having to pay for exactly those items. The list of her expenses that survives in Mozart's probate records ("bezahlte Konti") only concerns the composer's most recent debts. 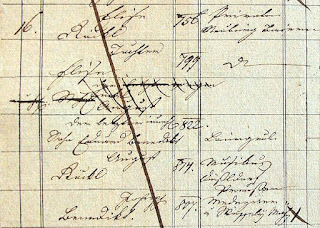 The list of Magdalena Dopler's immediate expenses concerning her husband's burial (A-Wsa, Mag. ZG, A2 1770/1789). Mozart was not buried in a linen bag without a coffin, because such burials were never obligatory in Vienna. Mozart was not buried in a mass grave, but in a customary "allgemeines Grab" (the usual common grave). Of course countless books on Mozart – and even the most recent ones – are rife with stories about Mozart's body having been sewn into a bag and mercilessly hurled into a mass grave. Most of the nonsense is based on Braunbehrens, who in his 1986 book not only fantasised about "the music that was performed at Mozart's consecration inside[sic] the Kreuzkapelle of St. Stephen's" (there was no music and the consecration took place outside the church), but also referred to "rental coffins having been the normal equipment of all parishes" (a claim that he of course corroberated with the notorious Klappsarg in Vienna's Funeral Museum). Let me show a number of the most typical examples from the literature. To nobody's surprise Maynard Solomon picked up Braunbehrens's error and described the idea of "being buried without a coffin" for Mozart to have been "a metaphor of the brotherhood of souls". 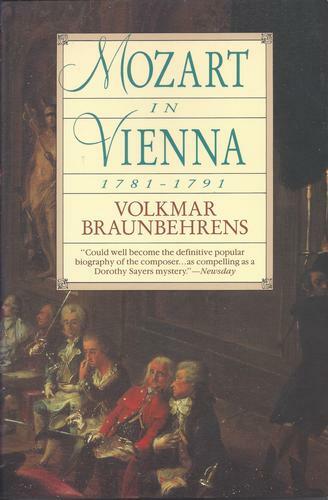 In volume two of his biography of Joseph II Derek Beales (as of 2013) erroneously claims that between 1784 and 1785 people in Vienna were "buried without coffins in mass graves". 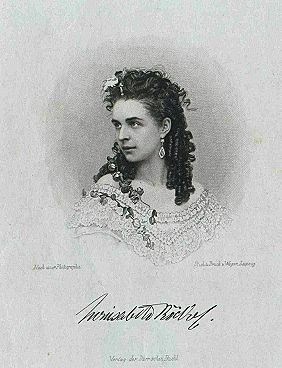 In her book A History of Opera Carolyn Abbate states (among many other falsehoods about the composer) that "Mozart was buried in a mass grave". Mozart biographers do not fare any better. Martin Geck firmly believes that "Joseph II spartan burial regulations were still valid in 1791" and so does Piero Melograni. In his 2009 book on Mozart's finances Günther G. Bauer describes Mozart as having been buried "in the dead of night in the usual mass grave". In 2009 Annette Kreutziger-Herr promises to answer the important question whether "Mozart was buried in a pauper's grave", only to claim again that Mozart's burial was not an exception and that "he was sewn into a linen bag". In her 2012 book about Constanze Mozart Gesa Finke describes Mozart "laying out in a simple reusable coffin" and being buried "wrapped a linen sheet in a mass grave". And yet, in her 2012 biography of Emanuel Schikaneder, Eva Gesine Baur definitely takes the cake. 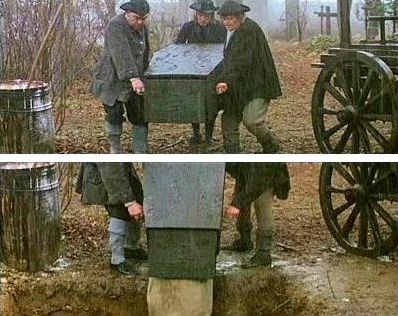 After having spent "a year and a half of research", she not only has Mozart buried with a reusable coffin (with flaps on the bottom), but also choses to honor Schikaneder with the exact same funerary procedure in the year 1812. Baur's text sparkles with stunning ignorance. For Mozart, his friend van Swieten had ordered a third-class burial with the smallest cortege[sic], certainly not impious, but common with the majority of the populace and also sensible, considering the financial situation of the widow. Schikaneder is also buried in the third class, like Mozart in a coffin that is opened at the bottom, emptied into a shaft grave and used again, just as Emperor Joseph II, the enemy of la pompe funèbre would have liked it. Swieten[sic] or Constanze had however rented a carriage with two horses to avoid a mass transport. A few remarks concerning this paragraph will suffice. A burial "mit dem kleinsten Geleit" is a misnomer caused by a misunderstanding. The term "kleinstes Geleit" did not exist in 1791. The correct term was "dritte Class". The Viennese dialect term "Geleit" did not refer to a Geleit (cortege), but to the Geläut (peal of bells). 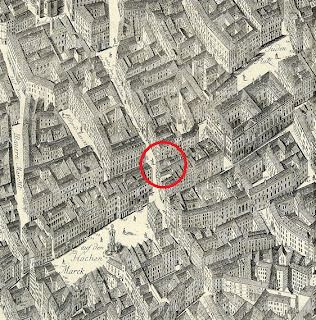 Baur's claim that "Schikaneder received a third-class burial" is not based on any documentary evidence. 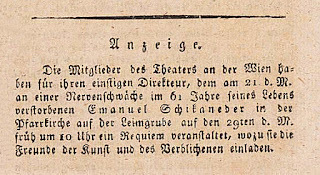 At the time of Schikaneder's death in 1812, the burial classes of Mozart's days did not exist anymore and had been replaced by a new Stolordnung (regulation of burial fees). Since the parishes of the suburbs had always lower burial fees than the parishes in the City, a comparison in this case is not possible anyway. 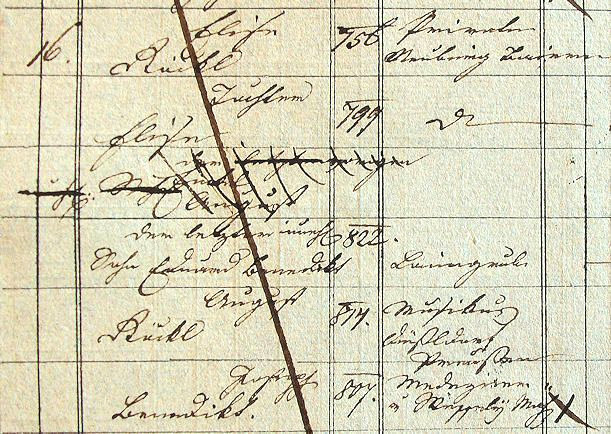 There is no source that documents the costs of Schikaneder's burial on 23 September 1812 (Pfarre Alservorstadt, Tom. 6, fol. 53). He was probably buried "5. Rubrik 3. Klasse", but this category allowed for various extra expenses that were paid apart from the parish fee, such as the cortege and expenses for an own grave. 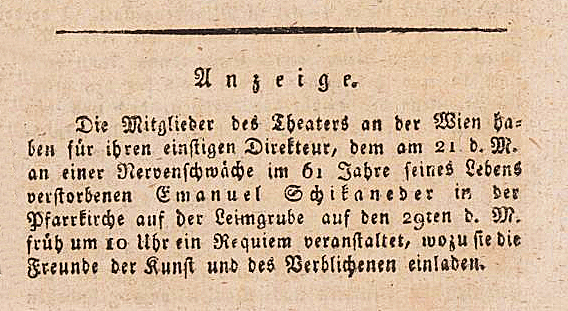 The fact that on 29 September 1812, at 10 a.m., Mozart's Requiem was performed for Schikaneder at St. Joseph ob der Laimgrube (which was the parish church of the Theater an der Wien) should make us reconsider the idea of Schikaneder having been buried without any effort and completely neglected by his former colleagues. It is true that in 1791 for 3 gulden a carriage was rented for the transport of Mozart's body to St. Marx, but there is no documentation concerning the number of horses that pulled this carriage. That there were two of them is a figment of Baur's reinless imagination. 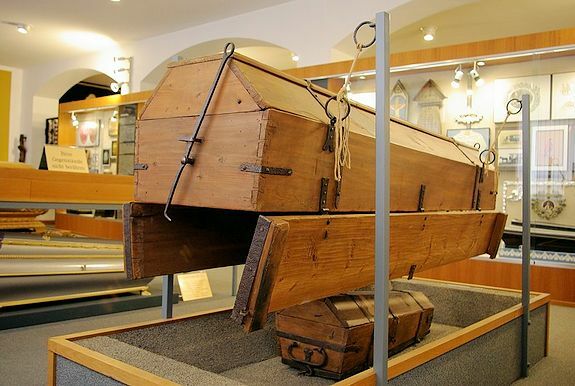 Similarly untenable is Baur's claim that without this carriage Mozart's body "would have become part of a mass transport". 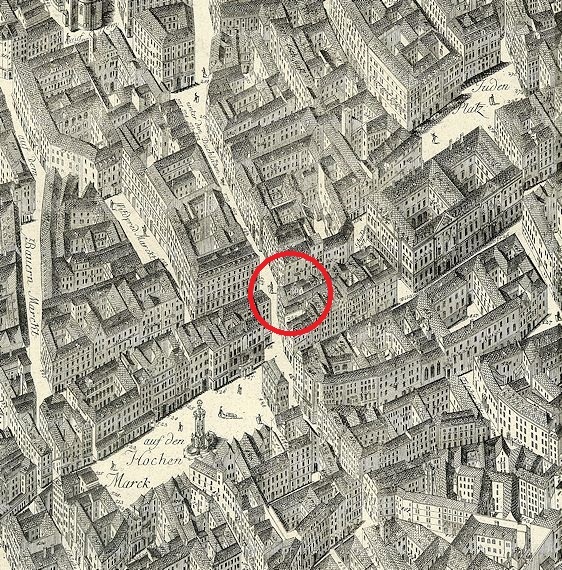 Since on 6 December 1791 Mozart was the only person to receive obsequies at St. Stephen's, to be buried in St. Marx, there was no possibility of several corpses being transported to this cemetery on one carriage. All the other deceased persons that were registered in the Cathedral's Bahrleihbuch on this day were either consecrated in other parish churches, or buried in other cemeteries, such as Währing or Matzleinsdorf (A-Wd, Bahrleihbuch 1791, fol. 337r-338v).